More than half the nation’s coal plants have now closed since 2010. It’s unclear if a controversial effort to support coal can reverse that trend. Two more U.S. coal plants are being shuttered, faced with the same low energy prices that have driven half the country’s coal-fired generation fleet to close since 2010. Because the plants are in Texas, they wouldn’t even have benefited from the policies being proposed by Energy Secretary Rick Perry that would provide cost recovery to power plants with 90 days of fuel supply on hand. Vistra Energy announced Friday that its Luminant subsidiary will close its Sandow and Big Brown coal power plants in Texas next year. The move, which will require approval by state grid operator ERCOT, will include layoffs of about 600 people and a charge of $70 million to $90 million in the fourth quarter of 2017. 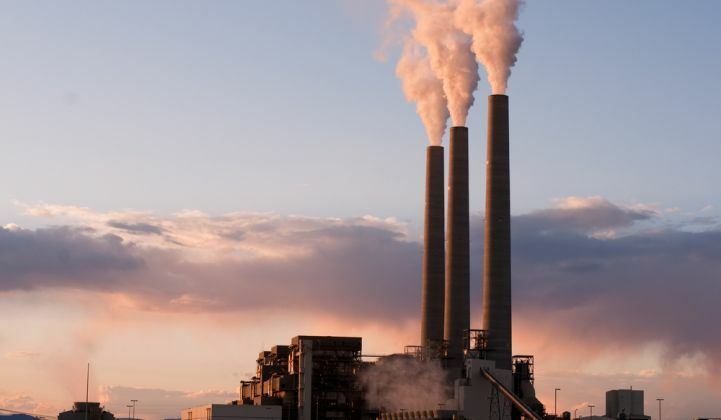 The closures will take offline about 2,300 megawatts of the 8,000 megawatts of coal-fired generating capacity still operated by Luminant, which is also planning to shutter an 1,800-megawatt coal plant in East Texas. The company also operates 7,500 megawatts of generation fueled by natural gas and 2,300 megawatts of nuclear power. Former New York Mayor Michael Bloomberg announced this week he is contributing an additional $64 million to move America off of coal -- an investment that will support the Sierra Club and other environmental groups. But this week has also seen significant pushes on several key Trump administration policy efforts to support the coal industry. EPA Administrator Scott Pruitt’s signing of a rule to rescind the Clean Power Plan is the highest-profile, although it’s unlikely to change the economics of coal-fired power. However, DOE’s notice of proposed rule making (NOPR), seeking to secure cost recovery in wholesale energy markets for reliability and resiliency features only nuclear and coal plants can provide, could have a significant effect. At the same time, “the federal government has begun a national conversation on the future of baseload power production in the United States. ERCC members believe that conversation is long overdue and appreciate the [Trump] administration's attention to reliability and affordable electric power,” the group wrote. DOE’s NOPR, filed late last month, asks the Federal Energy Regulatory Commission (FERC) to create a rule that would secure some form of cost recovery for power plants that provide reliability and resiliency. The NOPR’s qualifications for this status include having 90 days of on-site fuel supply -- something only nuclear, hydropower and coal-fired power can do. The rule, which would apply to the wholesale energy and capacity markets run by interstate grid operators under FERC’s jurisdiction, has been widely criticized by former FERC commissioners, free-market think tanks, solar and wind backers, and natural gas and oil trade groups, on the grounds that it would break with decades of federal energy policy and serve to prop up unprofitable plants and undercut more efficient alternatives. Critics also point out that the NOPR supplies no data on why on-site fuel supply is important for grid reliability, and fails to mention data to the contrary, such as that coal piles have frozen alongside natural gas plants during cold weather events such as the 2014 polar vortex, which the NOPR cites as the key example of why it’s needed. It also lacks data on why DOE feels it’s so urgent to act now, when utilities, grid operators and the North American Electric Reliability Corp. (NERC) have found that grid reliability is sufficient today, even amidst coal and nuclear power plant retirements. Despite this, DOE has proposed an unprecedented 60-day timeframe for taking public comment, creating a rule, and giving it to grid operators to enforce, compared to the months or years of stakeholder proceedings that it typically takes to decide much more minute changes in policy. In testimony before Congress this week, Perry defended the NOPR, saying any additional costs represent “the price of freedom” from blackouts. This week, FERC denied a motion by 14 industry trade groups to extend this tight deadline. Still, the NOPR faces an unclear future at FERC, where at least two of five commissioners have spoken out against it. Texas grid operator ERCOT lies outside FERC’s strict jurisdiction, since its grid lies inside the state’s boundaries. Still, it’s interesting to note that ERCOT will be conducting its reliability assessment of both plants set for closure, a prerequisite for shutting them down next year, in 60 days -- the same amount of time as DOE is asking FERC and the industry to take in crafting a rule that would alter the reliability status of hundreds of power plants across the country. Come join us for GTM's first annual U.S. Power & Renewables Conference in November. You'll get an in-depth look at how the renewable energy market will interact with the U.S. power market, and how those interactions can impact overall industry development and market growth. Curated by GTM Research, MAKE, and Wood Mackenzie energy analysts, we’ll take an expansive view of key issues and timely topics, bringing together a diverse group of energy experts and stakeholders to discuss demand dynamics, economics and business model shifts, and policy and regulatory implications. Learn more here.